Rag & Bones started in a tiny garage sometime at the end of 2010 and began holding ‘Monday Night Is Bike Night’ in 2011. The founder of the co-op, Joe Bock, was holding these nights by himself, as well as doing mobile bike repair on the roads of Richmond. 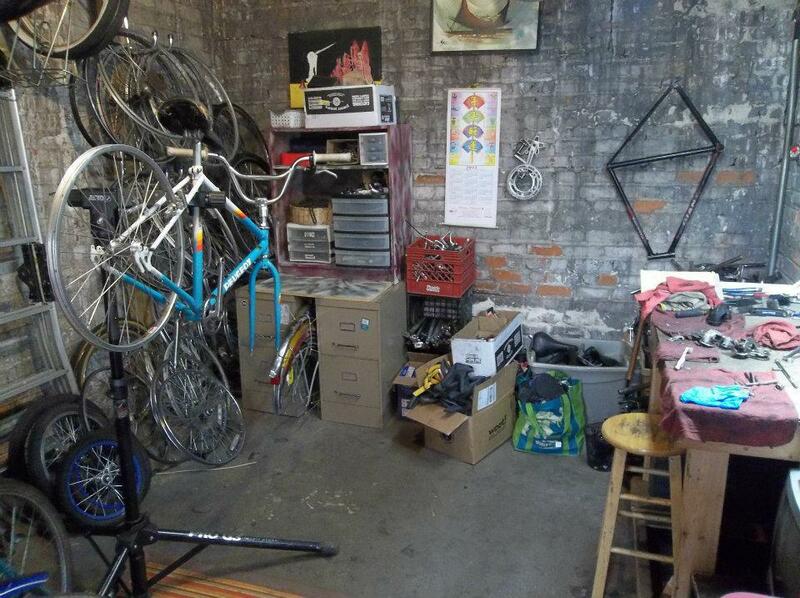 All the while he was amassing and organizing used bicycle parts and frames. In the fall of 2011 more members became super stoked on the project and began helping out. 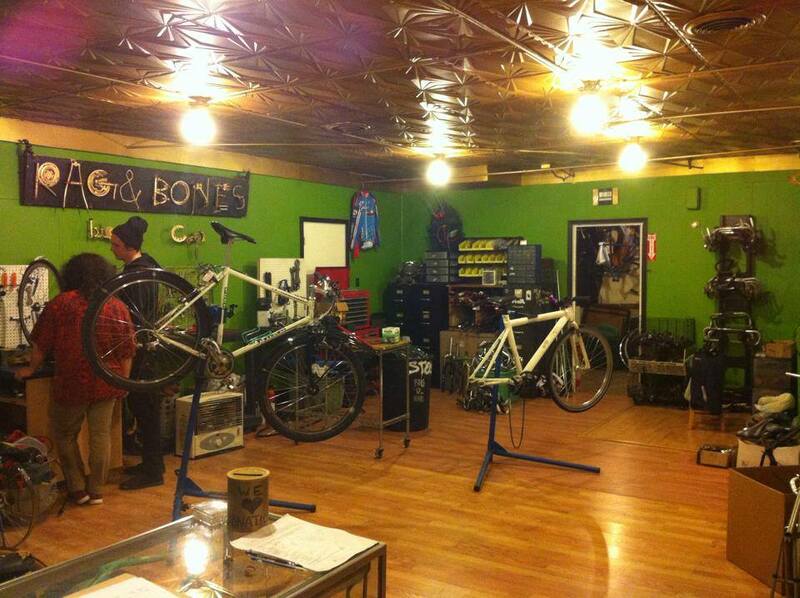 With the addition of more people to help run the project Joe was encouraged to expand it, at the time called RVA Bike Co-op, into a bigger space in Northside. The co-op moved into a warehouse at 1300 School Street in April of 2012. We shared the space with a moped shop, Shred Shed East, a zine collective, Hazardous Materials, and a few other private spaces. The grand opening took place in May of 2012. 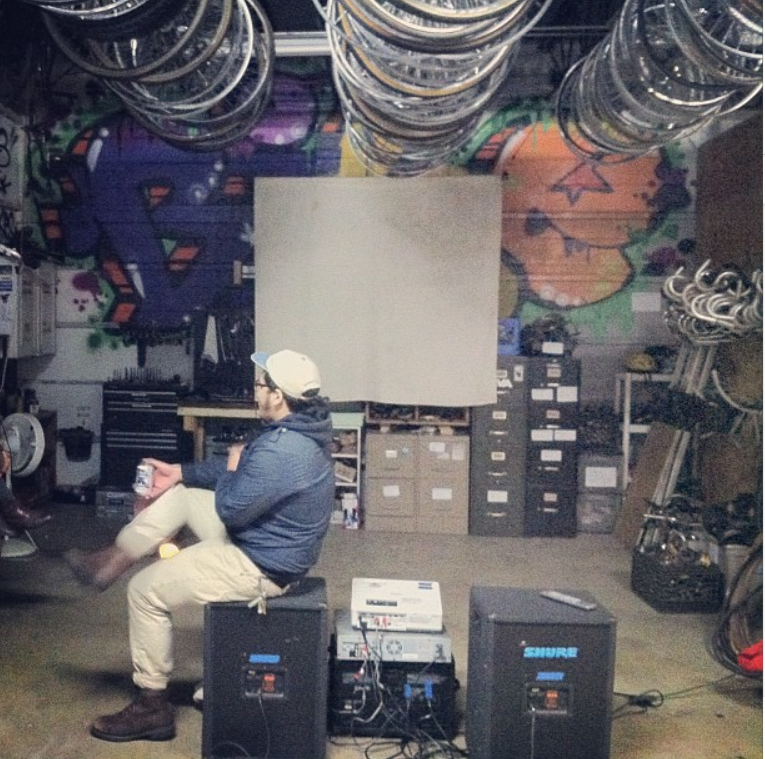 In this space we began hosting Bike-In Movie Night, as pictured above. We held a number of other events in this space including cook-outs, stops for races, and group rides starting and ending here. We even expanded our open hours to two days! After a lengthy discussion, we named the co-op Rag & Bones after the rag-and-bone man, who is known for scavenging unwanted items (rags, bones, and metals of various kinds) and reselling them to merchants. Rag & Bones remained in this space until January of 2013. In January 2013 Rag & Bones moved into Scott’s Addition. We continued to share our building with Shred Shed East. When we moved in the space was carpeted and had a drop ceiling, all of which was remodeled with the help of fund-raising done by Secretly Y’all. After attending Bike! Bike!, an international bike cooperative conference in New Orleans, Rag & Bones began hosting WTF Nights, which are an important part of being a diverse and welcoming shop space. We continue to hold these nights to further our mission of creating a safe and inclusive space to spread the knowledge of bike maintenance and repair. In 2015 Rag & Bones moved into the back of the building on 3110 West Leigh St. We began expanding our volunteer orientation. We hosted Bike!Bike! Southeast in 2016, and in the two years that followed, we hosted stops for various races, held shows, fixed many bikes and accepted many donations. Our time on Leigh Street allowed us to grow both our volunteer base and the amount of community members we served. In July of 2018, Rag and Bones moved once again to Create Space at 607 Wickham Street, where we are currently located. Looking to find other bike riders for rides, trails or tours. Want to learn more about bikes and upkeep!